Have you ever stood beneath a waterfall? If you have, you will understand that there is something both sacred and powerful about the energy surrounding you. Waterfalls are portals for purification. The soul seeking light is drawn to the waterfall to release fears. Three years ago, on a trip to Oregon, I took these photographs. You will see that two of them are filled with orbs. 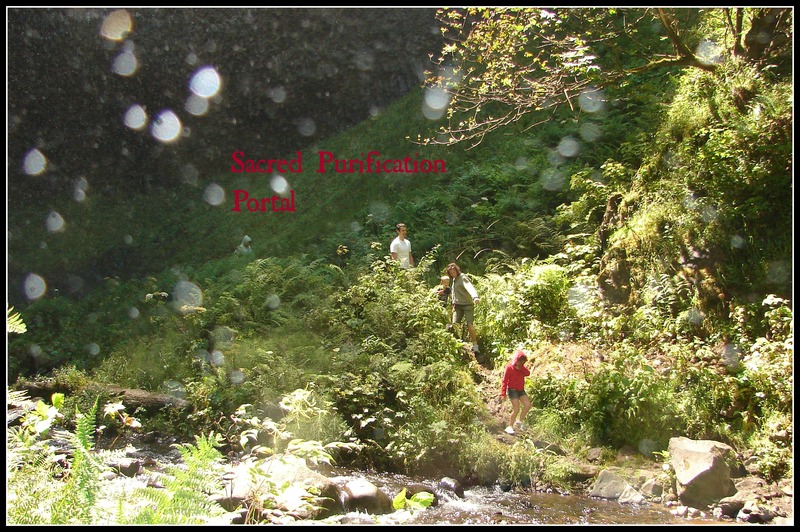 Some of these orbs are souls in transition, seeking out the purifying energies of the waterfall to cleanse and release the fears accumulated during their lifetimes before they make the transition into Light. We, in human form, are drawn to waterfalls for the same reason, to cleanse and release our emotional bodies, whether we are acutely aware of it or not. When you look at these photographs, you will also see orbs bringing healing light energy into the space (often in rainbowed hues), while other orbs are working to absorb this energy (notice the dull colored orbs that are not fully round). You do not need to stand under a waterfall to feel its energy (although I highly recommend doing so when you have the opportunity), instead you can enter this healing portal through meditation. A great time to cleanse your emotional body is during the waxing, or full moon, whose energy works naturally with the rhythm of the tides and the water element. Many people, as they become aware of the cycle of the moon will notice a pattern to the cycle of their emotional bodies. As the full moon builds, you may feel the pull to release fears that no longer serve you, and this waterfall meditation will help you to do so. As you prepare for meditation, find a comfortable place to sit, lie down, or if you have the privilege of working with a waterfall directly, you may wish to sit or stand underneath it. Wherever you are, find a safe place to go within and connect to Earth and the element of water. Close your eyes and take three deep belly-breaths. With each exhale, allow your breath to come out in a long, drawn-out “Ahhhhhh,” or imagine this sound if you do not feel comfortable uttering it in your space. With each breath you are bringing your fears to the surface and exhaling them with the “Ahhhhhh.” You need not dwell on what these fears are, just allow your body to release and prepare for meditation. After your three releasing breaths, allow your body to relax into a meditative state. Your breathing is now calm and quiet as you enter the portal of your waterfall. You may use these images, or allow your own waterfall to materialize inside of your mind if you are not meditating beside or under one. Know that you are in a sacred place of healing. The water spirits and angels in this portal are here to protect you, surrounding you with their protective energies of light, as well as working with you to release and transmute your fears. Draw upon all of your senses to enhance your experience. Imagine that it is a warm day. Your body is bare, yet it is warm like the air around you. Gently allow your emotions to come up, and without judgement allow them to pass through your body and make their way to to the surface of your skin where they are lovingly washed away by the falling water. You might see your emotions manifest as scenes so that you understand where the originated. Allow each one to appear in form, and as it appears feel the cooling drumbeat of the waterfall on your body. Hear its rhythm. Smell the fresh, cleansing breath of water as it falls on your skin. Each drop, each drumbeat, is taking your particular fear, or unwanted emotion, from the surface of your body, where you have brought it for release to carry it down to Earth. While you are standing under the waterfall, cleansing, you might want to visualize the transmutation of your fear(s) into an emotion or scene that brings you joy. As you do this, you will feel the energy shift and become lighter. Stand in your waterfall for as long as you feel drawn to, allowing whatever emotions that need cleansing to surface and be released. Know that there are both divine energies as well as Earth energies working with you, along with the water spirits, helping you to take way your fears. 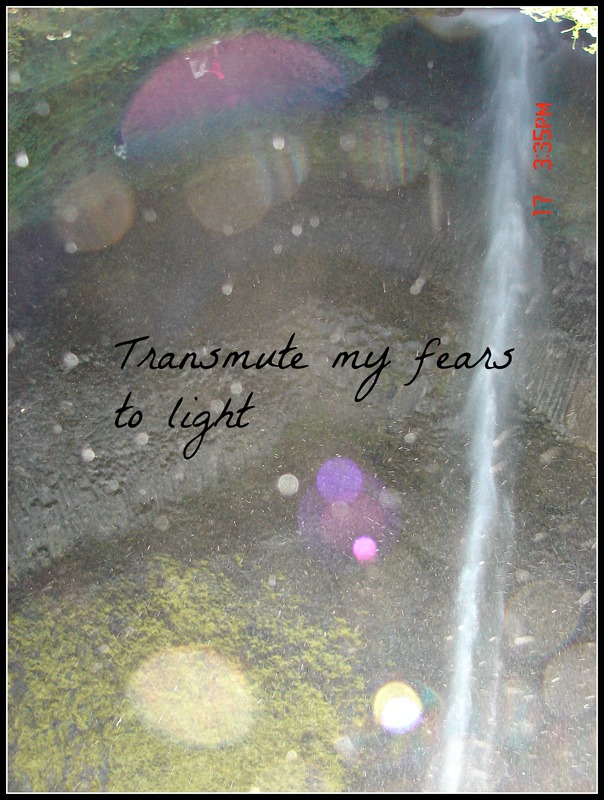 Some fears will release effortlessly into the light, lifting into that divine energy of the universe, while others may be draw with the droplets of water into Earth to be mulched and recycled into new growth. Imagine these fears finding their new life as they are broken down by the powerful, unconditional love of Mother Earth, who is willing to take their energy and transform it into new life. Inside her womb, Earth is filled with crystals caves, where healing is enhanced. Perhaps you will find yourself drawn into one as you use these powerful energy center to cleanse and recharge your cells. Imagine your cave filled with the crystals of your choosing. Perhaps your cave is studded with purple amethysts, or the soft hues of rose quartz. Maybe it is filled with clear crystals. Whatever you imagine is right for your healing at this moment. Reside inside this cave for a few moments, soaking in the healing energy it offers. When you are ready, bring your awareness back to your body, feel the Earth or floor firmly supporting you and slowly move your body and gently go on your day. Next time you are fortunate enough to find yourself in the presence of a waterfall, do give yourself the gift of its energy. Take time to be beside or under the falling water. Breathe and release. Notice the shifts you experience, notice the energy around you. Chances are, you will not be alone, and what a wonderful gift to share with other souls seeking light. I am an author and owner of Inner Truth Healing & Yoga. 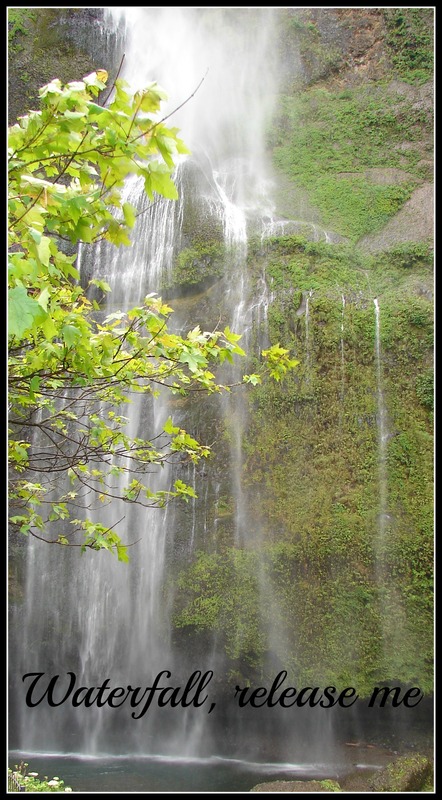 This entry was posted in Energy Healing, Gaia & Elementals, Meditations and tagged cleansing with waterfall mediation, energy healing, meditations, Mother Earth healing, Oregon waterfall photographs, releasing fears, water healing, waterfall mediation, waterfall orbs. Bookmark the permalink. I’m so glad you were able to see some of the beautiful waterfalls here in Oregon. I live in Portland, and it is a city full of water and full of lovely energies. Thank you for the wonderful post and meditation – and amazing pictures too! I love Oregon, the home of my birth (I was born in Portland). There is such nice energy in Oregon, I agree!